The OBGYN Pavilion understands that your medical information is private and confidential. Further, we are required by law to maintain the privacy of “protected health information”. “Protected health information” includes any individually identifiable information that we obtain from you or others that relate to your past, present or future physical or mental health, and the health care you have received, or payment for your health care. As required by law, this notice provides you with information about your rights and our legal duties and privacy practices with respect to the privacy of protected health information. This notice also discusses the uses and disclosures we will make of your protected health information. We must comply with the provisions of this notice as currently in effect, although we reserve the right to change the terms of this notice from time to time and to make the revised notice effective for all protected health information we maintain. You can always request a written copy of our most current privacy notice from The OBGYN Pavilion at the Ambulatory Surgery Center of Brooklyn Privacy Officer. Treatment means the provision, coordination or management of your health care, including consultations between health care providers regarding your care and referrals for health care from one health care provider to another. For example, a doctor treating your for a broken leg may need to know if you have diabetes because diabetes may slow the healing process. In addition, the doctor may need to contact a physical therapist to create the exercise regimen appropriate to your care. Payment means the activities we undertake to obtain reimbursement for the health care provided to you, including billing, collections, claims management, determinations of eligibility and coverage and utilization review activities. For example, prior to providing health care services, we may need to provide information to your Third Party Payer about your medical condition to determine whether the proposed course of treatment will be covered. When we subsequently bill the Third Party Payer for the services rendered to you, we can provide the Third Party Payer with information regarding your care if necessary to obtain payment. Federal or State law may require us to obtain a written release from you prior to disclosing certain protected health information for payment purposes, and we will ask you to sign a release when necessary under applicable law. 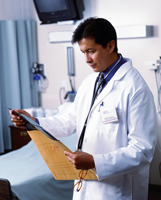 Health care operations means the support functions of our practice related to treatment and payment, such as quality assurance activities, case management, receiving and responding to patient comments and complaints, physician reviews, compliance programs, audits, business planning, development, management and administrative activities. For example, we may use your protected health information to evaluate the performance of our staff when caring for you. We may also combine health information about many patients to decide what additional services we should offer, what services are not needed, and whether certain new treatments are effective. In addition, we may remove information that identifies you from your patient information so that others can use the de-identified information to study health care and health care delivery without learning who you are. We may contact you to tell you about or recommend possible treatment alternatives or other health-related benefits and services that may be of interest to you. We may disclose to your family or friends or any other individual identified by you protected health information directly relevant to such person’s involvement with your care or payment for your care. We may use or disclose your protected health information to notify, or assist in the notification of, a family member, a personal representative, or another person responsible for your care of your location, general condition or death. If you are present or otherwise available, we will give you an opportunity to object to these disclosures, and we will not make these disclosures if you object. If you are not present or otherwise available, we will determine whether a disclosure to your family or friends is in your best interest, taking into account the circumstances and based upon our professional judgment. We will allow your family and friends to act on your behalf to pick-up filled prescriptions, medical supplies, X-rays, and similar forms of protected health information, when we determine, in our professional judgment that it is in your best interest to make such disclosures. | We may contact you as part of our efforts to market our practice’s services as permitted by applicable law. Subject to applicable law, we may make incidental uses and disclosures of protected health information. Incidental uses and disclosures are by-products of otherwise permitted uses or disclosures which are limited in nature and cannot be reasonably prevented. We may use or disclose your protected health information for research purposes, subject to the requirements of applicable law. For example, a research project may involve comparisons of the health and recovery of all patients who received a particular medication. All research projects are subject to a special approval process which balances research needs with a patient’s need for privacy. When required, we will obtain a written authorization from you prior to using your health information for research. (Note: In accordance with applicable law, we may disclose your protected health information to your employer if we are retained to conduct an evaluation relating to medical surveillance of your workplace or to evaluate whether you have a work-related illness or injury. You will be notified of these disclosures by your employer or the Center as required by applicable law. Organ and Tissue Donation. If you are an organ donor, we may release health information to organizations that handle organ procurement or organ, eye, or tissue transplantation or to an organ donation bank, as necessary to facilitate organ or tissue donation and transplantation. Military and Veterans. If you are a member of the Armed Forces, we may release health information about you as required by military command authorities. We may also release health information about foreign military personnel to the appropriate foreign military authority. Worker's Compensation. We may release health information about you for programs that provide benefits for work-related injuries or illnesses. Health Oversight Activities. We may disclose health information to Federal or State agencies that oversee our activities. These activities are necessary for the government to monitor the health care system, government benefit programs, and compliance with civil rights laws and regulatory program standards. Lawsuits and Disputes. If you are involved in a lawsuit or a dispute, we may disclose health information about you in response to a court or administrative order. We may also disclose health information about you in response to a subpoena, discovery request, or other lawful process by someone else involved in the dispute, but only if the Center is given assurances that efforts have been made by the person making the request to tell you about the request or to obtain an order protecting the information requested. Coroners, Medical Examiners and Funeral Directors. We may release health information to a coroner or medical examiner. Such disclosures may be necessary, for example, to identify a deceased person or determine the cause of death. We may also release health information about patients to funeral directors as necessary to carry out their duties. National Security and Intelligence Activities. We may release health information about you to authorized Federal officials for intelligence, counterintelligence, or other national security activities authorized by law. Protective Services for the President and Others. We may disclose health information about you to authorized Federal officials so they may provide protection to the President or other authorized persons or foreign heads of state or may conduct special investigations. Inmates. If you are an inmate of a correctional institution, or under the custody of a law enforcement official, we may release health information about you to the correctional institution or law enforcement official. This release would be necessary (1) for the institution to provide you with health care; (2) to protect your health and safety or the health and safety of others; or (3) for the safety and security of the correctional institution. Serious Threats. As permitted by applicable law and standards of ethical conduct, we may use and disclose protected health information if we, in good faith, believe that the use or disclosure is necessary to prevent or lessen a serious and imminent threat to the health or safety of a person or the public or is necessary for law enforcement authorities to identify or apprehend an individual. NOTE: HIV-related information, genetic information, alcohol and/or substance abuse records, mental health records and other specially protected health information may enjoy certain special confidentiality protections under applicable State and Federal law. Any disclosures of these types of records will be subject to these protections. Other uses and disclosures of protected health information not covered by this notice or the laws that apply to us will be made only with your permission in a written authorization. You have the right to revoke that authorization at any time, provided that the revocation is in writing, except to the extent that we already have taken action in reliance to your authorization. 1. You have the right to request restrictions on our uses and disclosures of protected health information for treatment, payment and health care operations. However, we are not required to agree to your request. To request a restriction, you must make your request in writing to the Clinic's Privacy Officer. 2. You have the right to reasonably request to receive confidential communications of protected health information by alternative means or at alternative locations. To make such a request, you must submit your request in writing to the Clinic's Privacy Officer. In order to inspect and copy your health information, you must submit your request in writing to the Clinic's Privacy Officer. If you request a copy of your health information, we may charge a fee for the costs of copying and mailing your records, as well as other costs associated with your request. The request for access is made by the individual's personal representative and a licensed health care professional has determined, in the exercise of professional judgment, that the provision of access to such personal representative is reasonably likely to cause substantial harm to you or another person. In any event, any agreed amendment will be included as an addition to, and not a replacement of, already existing records. In order to request an amendment to your health information, you must submit your request in writing to the Clinic's Privacy Officer, along with a description of the reason for your request. To request an accounting of disclosure of your health information, you must submit your request in writing to the Clinic's Privacy Officer. Your request must state a specific time period for the accounting (e.g. the three months). The first accounting you request within a twelve (12) month period will be free. For additional accountings, we may charge you for the costs of providing the list. We will notify you of the costs involved, and you may choose to withdraw or modify your request at that time before any costs are incurred. If you believe that your privacy rights have been violated, you should immediately contact the Clinic's Privacy Officer. We will not take action against you for filing a complaint. You also may file a complaint with the Secretary of Health and Human Services. If you have any questions or would like further information about this notice; please contact The OBGYN Pavilion Privacy Officer.